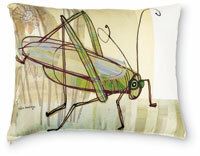 Artist Robbin Rawlings created the fun grasshopper shown on the pillow. You will find her work throughout our website. 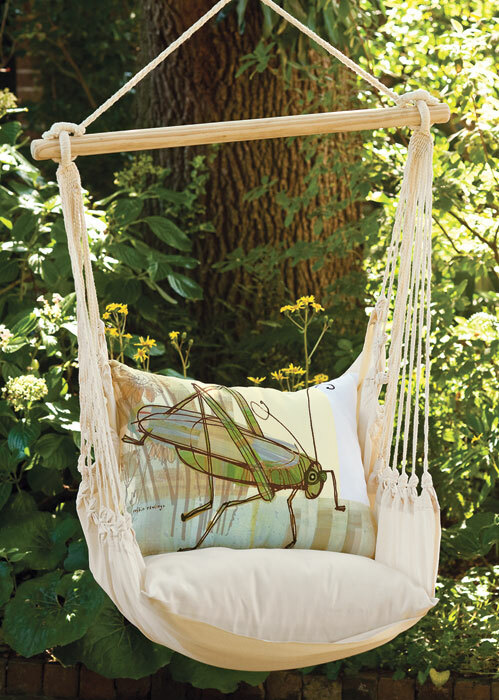 The swing itself is made by hand in El Salvador, using polyester fabric, poly fill inserts for the seat cushion and pillow, braided cotton, and a wood rod with metal ring for hanging. You’ll need to be sure that whatever you are suspending the swing from (tree limb, ceiling beam or joist, etc.) and the accompanying hardware are strong enough to support the weight of those who will use the swing (250 lbs. limit). Never leave a child unattended while in any swing chair. Seat cushion: 22"SQ. The Grasshopper Pillow (#4389) can be ordered separately. Formerly $195, now 40% off.